Most men are anxious about wine. Afraid of asking. Afraid of appearing ill-informed. Afraid they won’t recognize the “subtle hints of black currant confiture,” or whatever unctuous descriptor is most popular in Wine Spectator this month. Fear no more. Edify thyself at Ordinaire, just opened a block from the Grand Lake Theater. 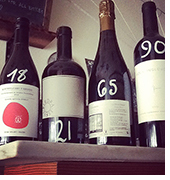 Here’s Ordinaire’s secret: they don’t hide the prices. Which is how the French do it. Hiding the price is an American tradition. Taylor honed his vino chops in France by practicing his French with vintners over carafes in his free time. And this is Ordinaire at its core. Unpretentious. Headed to a Sunday BBQ? Pick up Cirelli’s 2012 Montepulciano d’Abruzzo. It sounds fancy, but it can hang with burgers and fish and it’ll play nicely with your spicy sauce ($18). For the more romantic affair, go with the 2009 Young-Inglewood Cab, a dry, reimagined Cabernet with subtle notes of cacao and eucalyptus to complement your fancy cooking ($90). Or belly up and have a glass from the taps, which Taylor rotates regularly and pours sans label. After all, you don’t have to be an expert to drink like one.